On 12th July 1937, a new camouflage colour system was introduced. The new camouflage system consisted of Dunkelgrau – dark-grey – and Dunkelbraun – dark- brown. The colours Dunkelgrau Nr. 46 (today RAL 7021) and Dunkelbraun Nr. 45 (today RAL 7017) out of Farbenkarte – colour chart – 840 B 2 RAL were first mentioned in AHM Nr. 686 from 7th November 1938. According to a report from RAL, the dark-brown colour is specified as RAL 8002. Because RAL 8002 is the former Erdgelb – earth-yelow – Nr. 17 of the three colour Buntfarbenanstrich, this information seems to be doubtful. In several Allgemeinen Heeresmitteilungen – general army messages – (AHM), in which details of the camouflage finish were specified, this new camouflage finish was designated with different names. One time it is called Gerätanstrich dunkelgrau/dunkelbraun – equipment coating dark-grey/dark-brown – (AHM Nr. 687, 1938), than it is designated neuer Buntfarbenanstrich (Zweifarbenanstrich) – new multicolour camouflage finish (two-colour-coat) – (AHM Nr. 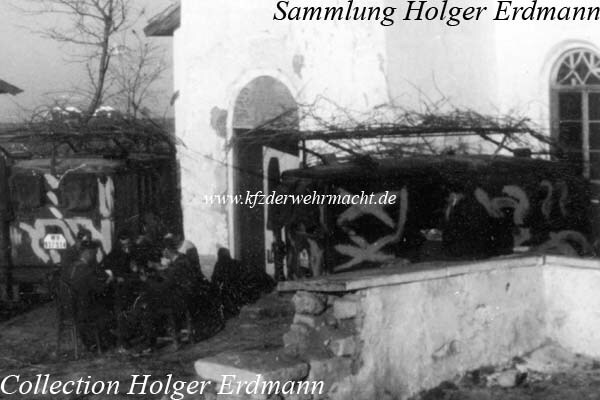 105, 1939) and several times it is designated Anstrich dunkelgrau/ dunkelbraun – coating dark-grey/dark-brown – (AHM Nr. 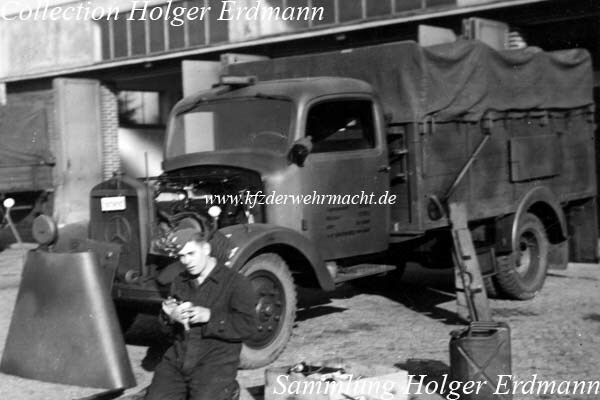 864, 1940 & AHM Nr. 281, 1941). If there was a compulsory name for this camouflage system could not be clarified. Initially, this order applied only to newly produced equipment and equipment which had to receive a new coat of paint. Equipment of the army ordnance depots, which was still painted in the three colour camouflage finish, should be delivered in its current condition. The colour Dunkelbraun Nr. 45 should be sprayed to approximately 1/3 over the base colour Dunkelgrau Nr. 46 in irregular patches. Hard colour edges should be avoided. Small surfaces should be painted only in one colour, Dunkelgrau or Dunkelbraun. If vehicles had to receive a new colour coating, the tarpaulins should retain the old colours. Interestingly, the new colours for pontoons and rubber dinghies were specified in AHM Nr. 70 from 7th February 1938 as Dunkelgrau – dark-grey – Nr. 29 (today RAL 6008) and Dunkelbraun – dark-brown – Nr. 18g (today RAL 8014) of the Farbenkarte 840 B 2 RAL. With AHM Nr. 687 from 7th November 1938, the application of the new camouflage system was dictated for the whole major items of equipment with no regard to the condition of the old camouflage finish. According to this order, tarpaulins and protective covers should now also receive the new camouflage finish. The treatment of equipment in army ordnance depots was regulated with AHM Nr. 105 from 7th February 1939. The neue Buntfarbenanstrich should be applied to the equipment until 30th June 1939. It was allowed to deliver equipment with the old three tone camouflage finish until that date. This should be repainted by the troop. Beginning on 1st July 1939, only equipment with the neue Buntfarbenanstrich (dark-grey/dark-brown) should be delivered. 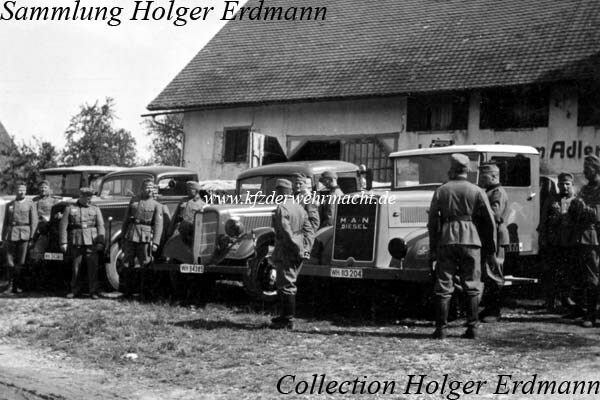 Equipment of mobilisation units should be repainted by the troop until 1st October 1939. It is doubtful if this order was accomplished due to the outbreak of the war against Poland on 1st September 1939. In the Kraftfahrtechnischen Anhang – automotive annex – to AHM Nr. 105 from 7th February 1939, further details for the camouflage finish were specified. Therefore, the colour coat of commercial passenger cars of higher staffs should be specified individually at the time of order. Motorcycles (inclusive sidecars) and commercial passenger cars for staffs and duty stations should receive a one colour coat of Dunkelgrau Nr. 46. Convertible hoods, seat cushions, saddle-bags etc. should be coloured in Dunkelgrau Nr. 46, too. All other motor vehicles should receive the Zweifarbenanstrich – two colour finish – of Dunkelgrau Nr. 46 and Dunkelbraun Nr. 45. Convertible hoods and tarpaulins should receive the two tone finish, too. Seats, backrest cushions etc. should receive a one colour finish of dark-grey. Steel helmets were painted in Feldgrau Nr. 3 (RAL 6006) until 1940. With AHM Nr. 428 from 4th April 1940, it was ordered that steel helmets should now be painted in Schiefergrau matt– flat slate-grey – because of camouflage reasons. This colour corresponds to today’s Schiefergrau RAL 7015. This Mercedes Benz type L 3000 S was most probably painted in the Dunkelgrau Nr. 46 and Dunkelbraun Nr. 45 camouflage pattern. The small contrast effect is remarkable. Probably this was a reason why the brown colour was no more used, later. Opel Blitz 3,6-36. This camouflage finish appears nearly unvisible on monochrome photos when it is covered even by a thin layer of dust. The dark-grey dark-brown camouflage pattern was used on this l. Zgkw. 3t (Sd. Kfz. 11), too. The tarpaulin of this m. Zgkw. 8t (Sd. Kfz. 7) is painted in the two tone camouflage patern, too. A camouflage finish is barely visible on the vehicle. Note the colour effects caused by dry and wet mud on the front wheel. The colour of a vehicle can appear much brighter when it is covered by a thin layer of dust. Contrary to the Army, the Air Force used the brighter colour RAL 7016. There are references that the Army used brighter grey-tones than RAL 7021, too. This could have been RAL 7016. Other grey shades are conceivable, too. But exact colour characterisations for these brighter grey colours are pure speculation. The stretching of the dark-grey colour RAL 7021 with cheaper white pigments is conceivable, too. With AHM Nr. 864 from 7th August 1940, it was announced that Dunkelgrau Nr. 46 should be used as the only camouflage colour for the duration of the war. These passenger cars of Art. Rgt. (mot) 14 of 14. Infanterie Division (mot) were painted in the one-colour dark-grey camouflage pattern. The vehicle on the left is a Ford Eifel and the vehicle on the right is an m. gl. 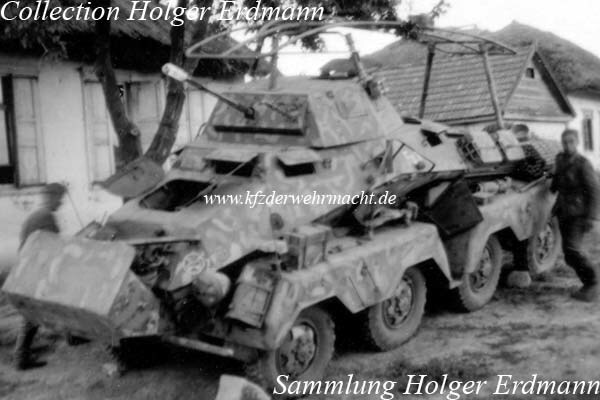 Pkw as Funkkraftwagen (Kfz. 17/1). 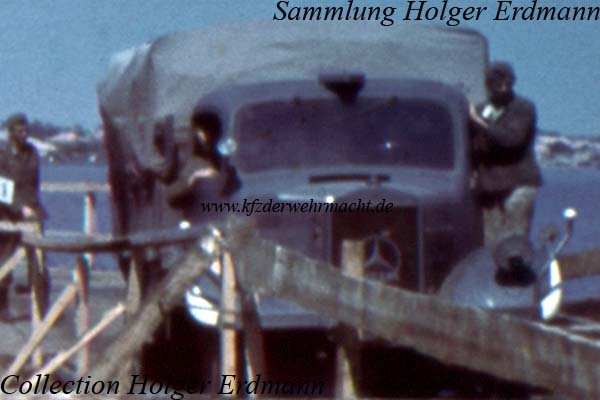 How dark the shade dark grey RAL 7021 really was is clarified by this photo of a Panzerbefehlswagen D1. The vehicle was fastidious cleaned for a swearing-in ceremony. With the interpretation of old colour slides one must be careful. But without doubt this Mercedes Benz type L 3000 S is painted in a brighter grey tone than RAL 7021, perhaps RAL 7016. These Funkkraftwagen (Kfz. 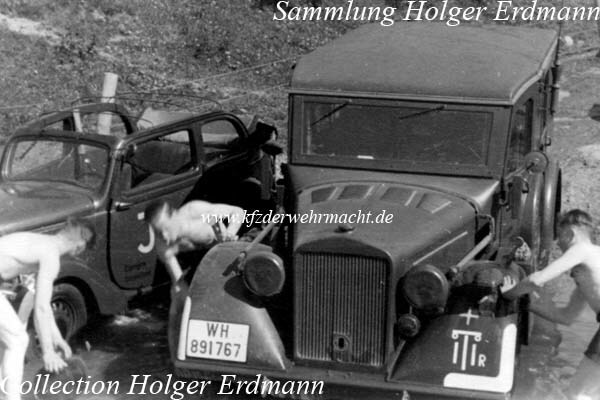 17) mit Einheitsfahrgestell für m. Pkw. were camouflaged with mud. This method of applying a camouflage finish was not very durable, but it could be renewed, easily. Depending on the operational area and the availability of suitable colours, the troop developed other camouflage patterns, too. 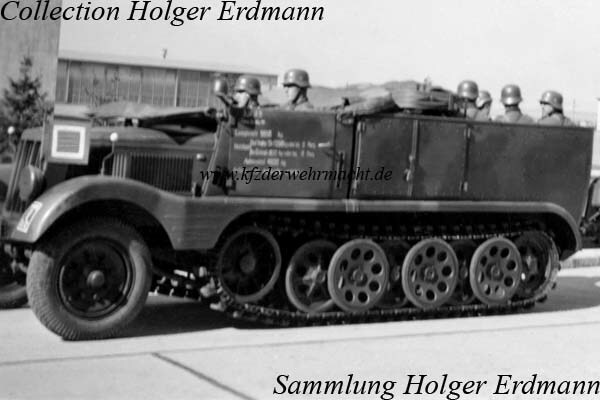 This schwere Panzerspähwagen (Fu) (Sd. Kfz. 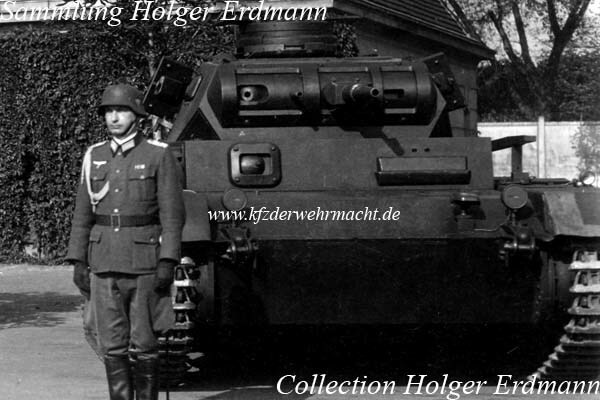 232) (8 Rad) belonged to Kradschützen Bataillon 43 of 13. Panzer Division. In 1942, the remnants of the armoured reconnaissance companies were integrated into the Kradschützen battalion. A camouflage pattern consisting of not less than two brown and/or dark yellow shades was applied on the dark grey base colour RAL 7021. Such camouflage patterns were widespread on the southern sector of the east front in 1942. 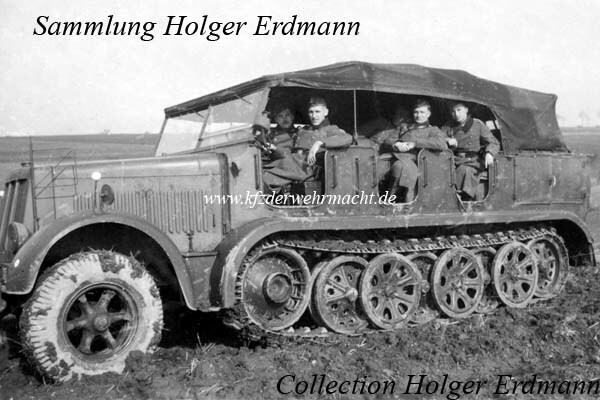 The Wehrmacht received many drawn in formerly civilian vehicles at the beginning of WW II. These lorries had received WH number plates and tactical markings but had not received a camouflage finish at that time. In many cases, units had not the time to apply a camouflage finish before the beginning of the campaigns. 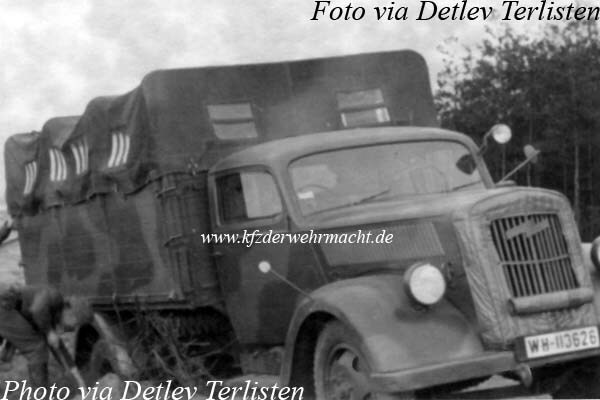 The lorry on the right is a rare MAN L 1, to the left follows a Ford V8-51 and a Opel Blitz 3,6-36.